This is a guest post courtesy of Miz Jenna where she very astutely breaks down how the Oxfam charity organization uses Twitter in an extremely effective way. The result is brand recognition, organization growth, and ultimately making a difference in this world. Take a page or two from their book and apply it to your own business strategy and you might just be surprised with the results! As always, do make Jenna feel welcome in the comments below if you’ve got a point of view to share. Oxfam has come a long way since it was founded in 1942 by a group of academics in Oxford, England. The original aim of the charity was to provide relief for a famine that had occurred in Greece due to the Allied naval blockades. In 2012, however, Oxfam is an international charitable force with multiple branches across the globe dedicated to addressing the structural causes of poverty and injustice. Like any successful not-for-profit organization, Oxfam is highly active online and utilizes several branches of social media to reach out to its supporters and keep them informed of pertinent issues around the globe. Each of the Oxfam Twitter feeds is consistent with the overall Oxfam look in a manner that is uniform but not overly corporate. 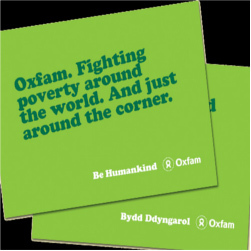 Quite apart from the recognisable Oxfam logo being used in all profile pictures, each Twitter page is coloured the distinctive lime green that the charity has made its own, but there are subtle differences in the style of each region’s page so that there is a real sense of local differentiation. Apart from the Oxfam feeds dedicated to serving supporters according to what country they live in, there are also feeds that cater to different types of fund-raising. The most significant of these is probably Oxfam Fashion, which is dedicated to serving the online contingent that use Oxfam’s charity shops and have a keen interest in style, the latest trends and thrifting. Obviously, most not-for-profits don’t have Oxfam’s fund-raising scope or range of followers but the lesson that can be taken away is the way in which Oxfam neatly addresses the issue of aggregating its diverse number of followers. From graduates seeking charity jobs to the aforementioned thrift store-fashion contingent, Oxfam is careful to specifically cater to its key demographics. This might have proved tricky to pull off on a single account as the kind of engagement that young, social media literate fashionistas expect would be too overwhelming for the charity’s main feed – you couldn’t gush over a 1950s sun hat and then tweet statistics about the death-toll of the Sudanese famine. The fashion feed has over 2,000 followers and is designed to actively engage with its audience in a more light-hearted and lifestyle centred manner that simply wouldn’t be appropriate on the main Twitter feed. This account focuses on conversation and engagement both with the young, usually female follower and the large retail brands that support Oxfam’s work. By routing its followers into different accounts, Oxfam is able to encapsulate a greater number of things to a greater number of people and the presence of the overall main feed Oxfam International (@Oxfam) means that particularly inspirational or useful tweets from the smaller and region-specific feeds can be retweeted to a more general worldwide audience. However important and wide-ranging the work of the charity, it’s important to strike a balance between the larger issues and acknowledging the actions of your supporters. An example here are these two tweets, one of which is wishing luck to the “4 lads” in Australia who are raising money with a sponsored hike and the other, which is raising awareness of another not-for-profit, Partners In Heath, which is fighting for the removal of healthcare fees in countries like Haiti and Sierra Leone. Twitter is all about making everyone feel heard and Oxfam has done some innovative thing with hashtags, most recently the #TweetG20 campaign which resulted in posters being made from memorable user tweets and displaying them on placards at the G20 protest in November 2011. There’s nothing more exhilarating then the feeling that typing something into your computer has tangible real-world consequences and this type of engagement is something that any charity can attempt, no matter what its scope. Twitter is an incredibly powerful promotional tool but as an organization gets larger, it can be easy to get overwhelmed. Following Oxfam’s example is a good way to go: separate out your demographic strands, keep a steady mix of global and local and make sure your followers feel like a tangible presence in the charity’s work. Jenna Russell is based in London and writes about Third Sector jobs, social media and audience engagement for various consumer websites and magazines.